BRUSSELS (AFP) - The 17-nation euro zone tipped into recession in the third quarter, with the economy shrinking 0.1 per cent compared with the three months to June when it contracted 0.2 per cent, official data showed Thursday. In comparison, the full 27-state European Union eked out growth of 0.1 per cent, again after a contraction of 0.2 per cent in the second quarter, the Eurostat statistics service said in a statement. Recession is defined as two consecutive quarters of decline, putting the eurozone technically in recession as the debt crisis undercuts growth and pushes unemployment soaring to record highs. 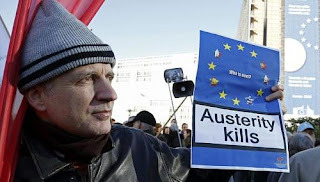 Compared with the third quarter in 2011, the eurozone economy shrank 0.6 per cent in the three months to September while the EU was down 0.4 per cent.